Ford Performance teams up with Lego for new Le Mans set – we build it against the clock! Lego has just released a new £30 Speed Champions set featuring the Ford GT40 from 1966 and last year’s Ford GT from the Le Mans 24 hour race. The set has been designing by Lego design lead Craig Callum, a British former real-life car designer who races a Ford Model A in his spare time (below). Ford says the GT is its most advanced Ford production vehicle ever, with a supremely lightweight body and its EcoBoost engine able to achive a top speed of 216mph. The Ford GT40 Mark II was no slouch either, powered by a 7.0-litre V8. In case you didn’t know, the 40 represents the vehicle its height at the top of the windscreen in inches. Callum developed ten prototypes before the final versions of each model were selected, all created from existing bricks. The new set features both cars, a racing driver minifigure for each, a chequered flag, podium and trophy. “This was a dream project – with a lot of pressure,” he says. “We know these models will be closely scrutinized for authenticity.” Callum also told us he had a short timeline for the project which is part of an ongoing partnership with Ford. Most sets normally take a year to develop and bring to market and have a shelf life of around 18 months. T3.com was invited to Lego’s HQ and factory in Billund, Denmark to build the set and tour the factory. We’ll bring you our factory write-up soon (it was a real eye-opener). 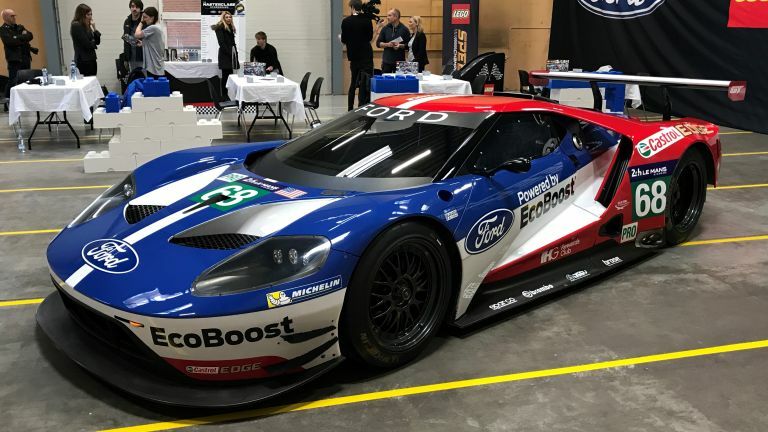 We took part in a competition to build the winning 2016 Ford GT against the clock – and in the presence of the actual car. We didn’t do too shabbily, we can tell you – taking 26 minutes. While you might think that’s a long time, we came third out of 14 behind Lego designer Callum (he did it in seven minutes) and Mark Guest of Bricks magazine (13 minutes) who, y’know, builds Lego sets for a living. The sets are aged 7-14 so contain plenty of advanced elements and some parts were actually quite challenging to put together – one of the most challenging sets we’ve built that isn’t Technic. We’ve since built the GT40 as well. If anything, it’s an even more clever model with the way the sloped front is put together a particular highlight. Ford will be taking four Ford GT race cars to Le Mans for the 2017 race later this year.